Clay Cross's Josh Brown (left) works hard to try and stop Mickleover goalscorer Danny Minto. A flawless record in the league counted for nothing when Clay Cross Town were dumped out of the Central Midlands League Cup at the first attempt. Clay Cross top the North Division with five wins out of five, but an under-par performance saw them lose 3-1 at Mickleover Royal British Legion, who sit second in the South Division. The Millers were behind from the 14th minute when Jason North swivelled in the box and fired hard and low past goalkeeper Ryan Hopkins. Furhter chances fell at both ends, but whereas Clay Cross’s finishing was lacklustre, Mickleover doubled their advantage at a crucial time, seconds before the break, when North struck again. The visitors descended on the Legion goal in the second half, but some fine goalkeeping by Ash Warner ket them at bay, and it was soon 3-0 when Danny Minto cut inside and fired home from an acute angle, with the Millers complaining that the ball had originally gone out of play. 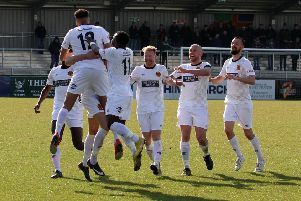 At the other end, Josh Scully’s free-kick ricocheted off the bar before Clay Cross finally found the net two minutes into injury-time when Josh Parfitt drilled home a consolation. This Saturday (kick-off 3 pm), it’s back to league action for the Millers when they host mid-table Dronfield Town Reserves at Mill Lane.